The last game of the first half of the season for FC Barcelona saw them run out 5-0 winners over Levante. The victory allows Fran Sánchez’s team to remain top of the table and claim the honour of being the ‘Winter Champions’ of the first division. 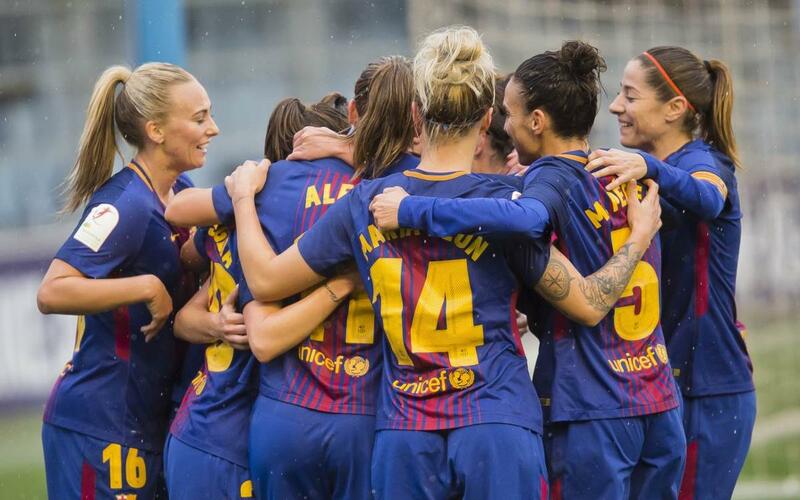 Goals from Bussaglia, Patri (2) and Alexia in the first half and one from Leike Martens after the break underline the blaugranes’ dominance in the contest. Barça started as they meant to go on against Levante with Toni Duggan going close early on, the striker denied by a good save from keeper Noelia. It was not long, however, before the home side were in front; Bussaglia combined well with Alexia and the French international finished well to give Barça the lead. Patri scored twice in the space of 10 minutes to extend Barça’s lead, both goals coming from corners. Duggan was denied again by Levante keeper Noelia before Alexia turned in a rebound to make the half time score 4-0. In the second half Leike Martens got her name on the scoresheet after hitting the bar not long after the restart. The Dutch striker’s goal was virtually her last contribution to the contest as she was replaced with the score at 5-0. The B team striker Candela made an appearance as a second half substitute, a debut at the Miniestadi for the youngster. Barça’s win leaves them top on goal difference of the Iberdrola League, tied with Atlético on 40 points. Barça Women’s next game comes at home once again against Zaragoza.